That’s for the bird game. It’s fun. I used to make some for my children when they were small, just to keep them in one place when they were bothering me too much, asking me what to do. 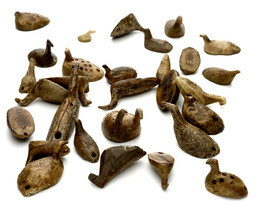 These ivory bird carvings are pieces for a game that was traditionally played all across the Arctic. Bird figures found in archaeological sites show that the game spread across northern Alaska, Canada, and Greenland about a thousand years ago, carried by migrating Thule ancestors of the modern Inuit. Some birds land upright when tossed onto the ground, while others tip over onto their sides. Different species of ducks or geese are indicated by the shapes of the birds’ heads and the markings on their backs. Ralph Apatiki, Sr.: Taawa ukut liisalghiinga mekelghiighhaluta kuvaaghaatnguftut taakut esghaghyaqeput. Elaine Kingeekuk: Ayveghem llangaqa gguutkii. Elaine Kingeekuk: Milulluki ukut amalka naghaaghnaqegkumta elpek milulleqaaten. Taagken alla kaaskumi ellnganun ellngan qawaaggani tuguluku pillugutesleqiit. Naasqwitgun tuguluki whanga qawaaggaqa tugulleqaa nalluniilnguq. Whanga or ellnga nekevghakuma napaghngakumi whanga kayaalqillequnga. Kingulighpiigaam naghaaghllequukut naghaaghllequkut kingulighpiigaq uglalqaq kayaalqiillequq. Ungipamsugginaq whanga nagaqulqegka apeghnaqaqa uumqun esghalleni aapghaqegkanga. Ralph Apatiki, Sr.: Maaten entaqun ilaaraalguut atullghi ukut naliita whaa. Whaa utut azuzillghistun piyaqumki taakepigtut naghaaghusii. Tawatennayalghiit whanguta qayughllak eslatlu naavenghaata qerngughlluta teghignapigtut naghaaghutngulghiit. Estelle Oozevaseuk: That’s the game bird. We call it meteghlluwaaq [bird carving for game]. (1) And the way we play, we call it kuvaghaq [how the game is played with meteghlluwaaq—hold all the toy birds in cupped hands, drop them to the floor and pick up the ones that land standing right side up]. Sometimes we used ten [pieces], any players. When there are many [players], twenty [pieces]. The way we play them, you put their heads together [pick up two by the head with one hand] and [drop them]. This has been killed [bird that falls on its side]. It goes on like that and the last ones who have more standing up, they put them aside. And it goes again. That’s the way we play. Each one takes them and tosses them. Takes the standing one, next one. Takes the standing one until they’ve all been taken. That’s when the wrestling starts. Branson Tungiyan: And that’s why so many broken heads. Aron Crowell: So each player throws them, taking turns? Estelle Oozevaseuk: Mm-hmm. The players goes like that [clockwise direction]. It’s fun. I used to make some for my children when they were small, just to keep them in one place and when they were bothering me too much, asking me what to do. So they sat having fun. Branson Tungiyan: Ilangi esgha—unallu esgha allakaayaguuq. Qaaymikun alla. Estelle Oozevaseuk: That has a little baby on back. Branson Tungiyan: Unallu entaqun esgha uutun maalghugegneg naasqulguyaghtuq. Estelle Oozevaseuk: Yes. Meregta [place name of old settlement on the other side of Gambell mountain] has so many of that kind. There we find more. But in Ketngipalak [old campsite southwest of Gambell], nothing. For years, I’ve been trying to find them find. Branson Tungiyan: Maakutughngam sangamengqaaymengteggun ukimalleqengeltat. Unallu esgha, terellelek inglugtun, naqam ilangi avangitut. Estelle Oozevaseuk: Temngi entaqun pinighnaghqemmun. 1. According to St. Lawrence Island Yupik Elder Vera Kaneshiro, meteghlluwaaghet [set of toy birds for boys’ game]—plural of meteghlluwaaq—were mostly made by grandfathers and also uncles. Other animal figures might be an agha [amulet, medicine, aspirin]. An agha, as an amulet, was used to bring good luck, to protect against harm and for healing. In play, some birds land upright when tossed on the ground, while others tip over on their sides. Different species of ducks or geese are probably represented by the shapes of the birds’ heads and by the markings on their backs. They have holes through their tails so the pieces can be tied together with a string. On St. Lawrence Island, as Elders explained in 2001, the first round of the game was to divide the birds among the players. Each person cupped the birds in his hands, shook them, and spilled them on the floor, keeping only the figures that landed in a sitting position. Each then “wrestled” his birds against an opponent’s. He held two of the bird figures between thumb and forefinger, rubbed their heads together, and flipped them down. Birds that tipped on their sides were “killed.” The winner added the dead bird to his pile, and play continued until one person had won all of the pieces.